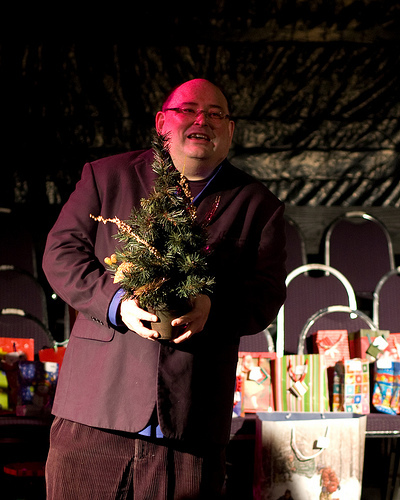 Thanks to our exuberant hosts Michael Miyazaki and Ron Squeri, who ran our Open Mic, Holiday Edition, so effortlessly on Monday, December 7th. Two marines visited to collect donations for the Toys for Tots program, and then we got down to singing, smiling, laughing, consuming terrific refreshments, and having a great time. You can see Matt Howe’s stunning pictures of the evening here. And if you missed it, well you’ll just have to try harder next time! 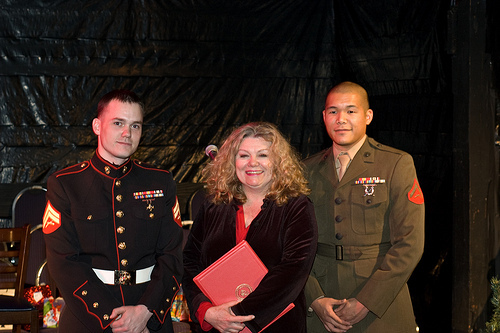 Terri Allen with our Marine guests. One of our favorite trees, Michael Miyazaki.